Introducing the first Model United Nations Society in the history of COMSATS, CMUNS, we aim to provide a platform to the CIIT students for learning, participating and hosting Model United Nations simulations. 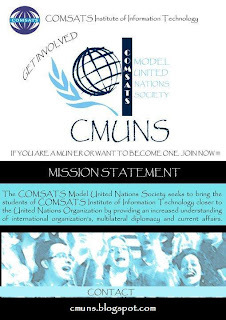 The COMSATS Model United Nations Society seeks to bring the students of COMSATS Institute of Information Technology closer to the United Nations Organization by providing an increased understanding of international organization’s, multilateral diplomacy and current affairs. CMUNS is in search of enthusiastic youth as its administrators and members. 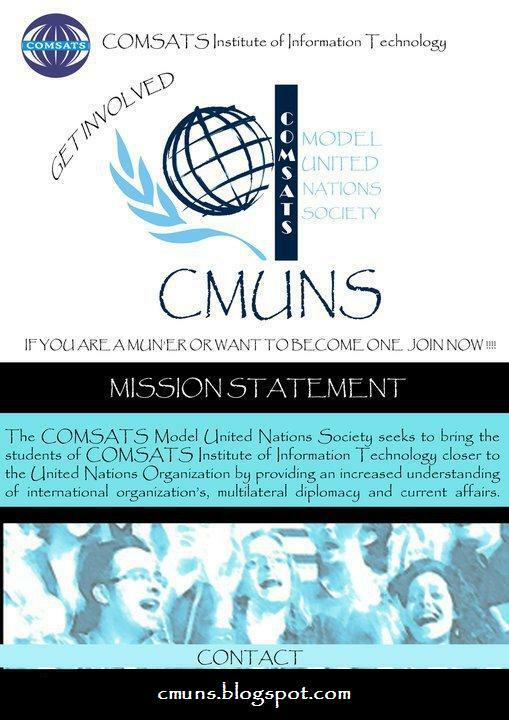 If you think you have what it takes for being an MUNer, then join in and be a part of CMUNS! Any queries? Feel free to contact us at cmuns2011@gmail.com.